Efficiency and capacity, consistency and reliability – the high-performance, heavy-duty DeLaval parallel rotary PR3100HD brings all the benefits of rotary milking to large-scale dairy operations. DeLaval has designed the PR3100HD parallel rotary specifically for large-scale operations, long runtimes and high performance – for 24/7/365 dairy farming. An entry 1.5 cows wide, low-profile cabinets and 15-degree rump rails bring the cows in quickly, while an intuitive exit bow makes it easy for them to exit. The PR3100HD parallel rotary can be configured to suit your farm and your style, adapting to variables such as cow size and weight, platform-deck material, runtimes and performance requirements. In large-scale operations, even small improvements can make a big difference to your bottom line. The system can also include automated farm management, identifying cows as they pass through the milking cycle and collecting a range of data. Information such as yield cycles, activity levels and weights help you predict and avoid problems such as sickness or falling milk yield. Like all DeLaval systems, the PR3100HD is built to last. It combines the latest technology with top-quality components and construction, and is built to be compatible with future innovations. 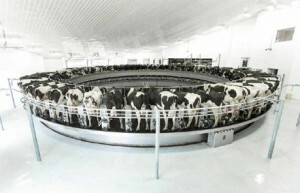 It is designed from the bottom up to provide improved conditions for both the operator and the cows. The cows come to the work station, allowing the operator to focus on essential milking tasks without having to bother with cow flow. Short walking distances, consistent routines and individual stalls keep the herd calm and avoid disruptions. Platform entry, pre-milking work routine, milking unit attachment and cow exit are the same every time. Platform speed may be adjusted to suit herd-milking ability and size, coping easily with extra cows or short loads and giving each animal equal time for milk-out. Consistent, individual stalls and simple cow flow make traffic management easier.